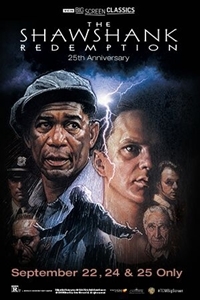 Fathom Events, TCM and Warner Bros. present a special 25th anniversary showing of The Shawshank Redemption coming to select cinemas for a special event that includes exclusive insight from Turner Classic Movies. From a novella by best-selling author Stephen King comes a poignant tale of the human spirit. Red (Morgan Freeman), serving a life sentence, and Andy Dufresne (Tim Robbins), a mild-mannered banker wrongly convicted of murder, forge an unlikely bond that will span more than twenty years. Together they discover hope as the ultimate means of survival.